Showing up empty handed is never a cute look on a guest. Bringing some sort of gift to the party host isn't required per se, but I can say with confidence it's kind of a jerk move to not. The host put a lot of time, energy and money into creating a great party for her guests. Showing up with something that says "thank you for taking multiple trips to the grocery store, spending the evening filling up my wine glass, and spending too much money on flowers," really goes a long way. A bottle of wine will always suffice, but if you want to kick it up a notch, I've rounded up some of my favorite host gifts for this month. A lovely-scented candle that doubles as a decorative piece is an ideal host gift. This floral flame comes in nine different scents/colors. Buy it here. The hostess with the mostess will probably be exhausted the morning after throwing a night to remember. Especially if a lot of wine was involved. 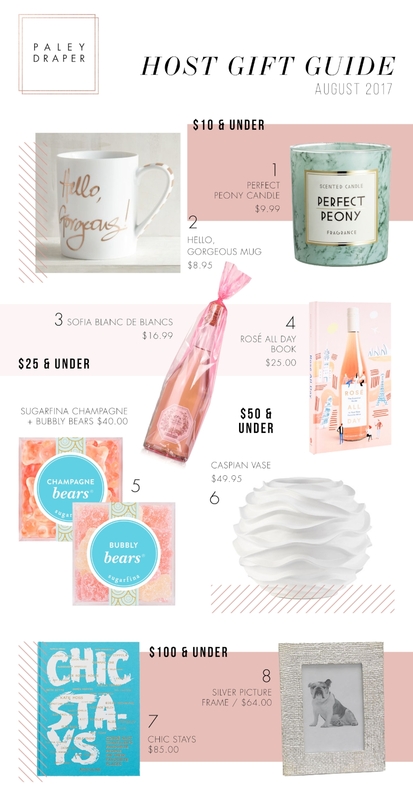 Make sure she wakes up to a confidence-boosting message with this "Hello Gorgeous" mug. Especially if the chances are likely she'll have last night's mascara still on her mug. I usually do. Buy it here. I love this sparkling wine for three reasons. One: it comes pre gift-wrapped so it looks like you put in more effort than you actually did. Always a plus. Two: the pretty bottle makes it only look expensive. Three: it tastes ~fruity and refreshing~. You can find it in most liquor stores or buy it here. Expand your host's knowledge of Instagram's most photogenic wine with this essential guide. She can flip through the pages to learn about each rosé regions, specific wines to try and suggested food pairings. #yeswayrosé. Buy it here. What's better than gummy bears? That would be gummy bears infused with Dom Pérignon Vintage Champagne. It's like dessert and happy hour had a baby. Buy them here. This vase is a good option if you're going to a house party. It's neutral so it can fit in with pretty much any interior design motif but still interesting enough that it's not boring. Go the extra mile by filling it with flowers. I promise you'll be invited back. Buy it here. This book by Assouline is full of chic people talking about the chicest places they've ever been. It's perfect for the chicest host. Buy it here. Another good option for a housewarming party, the shimmering metallic and linen-like texture of this picture frame make it feel super luxurious. If you feel like creeping people out, put a picture of yourself in it. Buy it here.